I’m really not sure whether this “works” or not… feedback would be appreciated. Not sure what you mean by “works”, but I like the photograph. I usually find a mixture of color and black-and-white disconcerting, but the color definitely “makes” the photo in a way that pure b&w wouldn’t. Took me awhile to notice the faint red tinge to the chalk on the blackboard: was that color in the original chalk, or was it photographically enhanced? You have a great eye, Rob! Thanks. Yeah, I was concerned about how bleached-out the rest of the photo was. Nope, the chalk lanterns on the blackboard are “almost” original colors. They got modified along with the real red lantern. hi robert, what is it you are uncertain about? 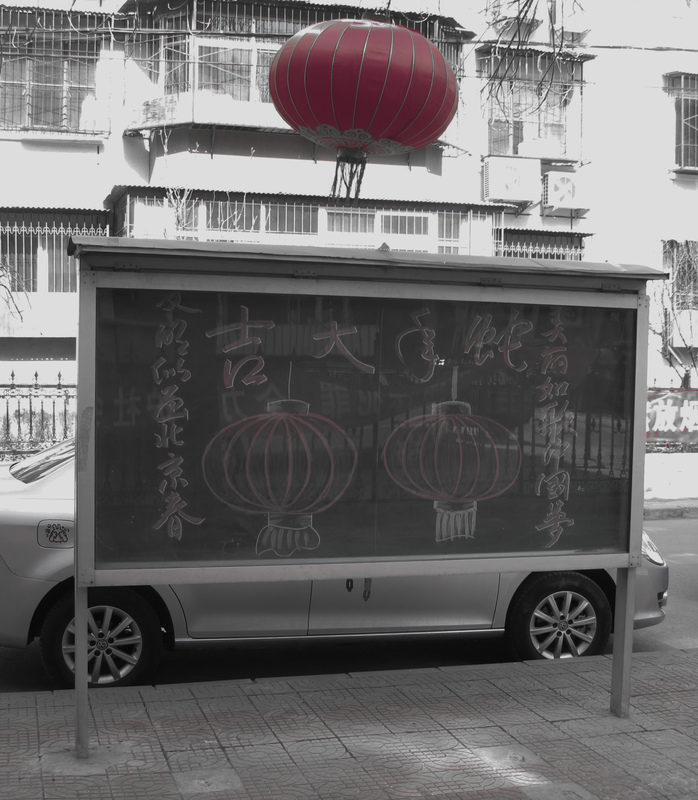 i think it works like this…especially the black and white feeling and the red of the lantern. but, i started to play around with it after reading your comment and i would suggest that you see what happens if you bring it in tight on both left and right side,up to the billboard so that the front and back of car disappears and yet the car body is there. gives it more of the haunting feeling that is already suggested. it is an extreme crop and not necessarily right, but see how it feels. again, i like it as it is too. the red lantern against that sun bright background really pulls my eye in a wonderful way. Thanks. I think it would’ve lost some balance if I’d cropped more, but I could’ve certainly removed the thing on the gas tank lid. as I told John. I felt some of the picture was a bit too blown-out. but, i felt that the blown out part worked well with the color lantern and the color on the display lanterns.